In June, HP announced their ePrint technology, which enabled you to email any ePrint-enabled printer a document and have it print out. My first thought was that it would be a great way to send prints of the kids to my parents. However, the first products just printed whatever files they received on paper from the main paper tray–not very effective if your goal is to make prints for grandma. 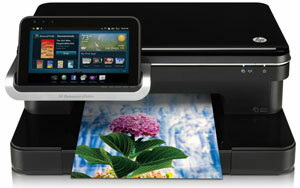 This latest batch of ePrint printers is smarter. They can check to see what type of file they're receiving and print from the photo paper tray when you send pictures. It really couldn’t be simpler. You type in the email address of the printer, attach your photos and hit send. The printer on the other end will receive your email whenever it’s attached to the recipient’s home network and print out the photos. Currently there’s only one ePrint printer with a separate photo paper tray, HP Photosmart Premium Fax e-All-in-One Printer ($300). However, more are due later this fall, including Plus e-All-in-One ($250), Premium e-All-in-One ($200) and the eStation All-in-One ($400). The eStation, like the others in the ePrint line, has access to printer apps you can download to your printer. You can print movie tickets from Fandango, coupons from coupons.com, coloring book pages from Crayola, pictures from your Snapfish photo account and news from MSNBC, to name just a few. 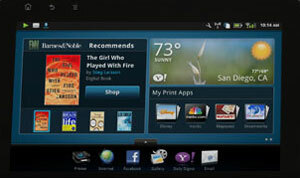 In addition, the eStation has a 7-inch removable Wi-Fi touchscreen that lets you run those and other apps, including the Barnes & Noble Nook ebook reader app and a full web browser.